Star Wars Lightsaber Thumb Wrestling Game Just $7.29 Down From $13! You are here: Home / Great Deals / Amazon Deals / Star Wars Lightsaber Thumb Wrestling Game Just $7.29 Down From $13! 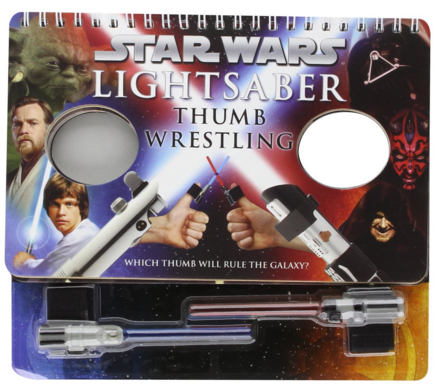 Make thumb wars a little more challenging with Star Wars Lightsaber Thumb Wrestling Game for just $7.29 down from $13 on Amazon! Get yours now while it lasts! This Star Wars game in a book provides hours of fun for thumb-wrestling masters or their apprentices. Opponents Velcro on the lightsabers included (one blue, one red); open the book to one of seven durable “game board” pages depicting classic Star Wars battles; stick their thumbs through the holes; and use the Force (of thumb and imagination) to wrestle to victory!